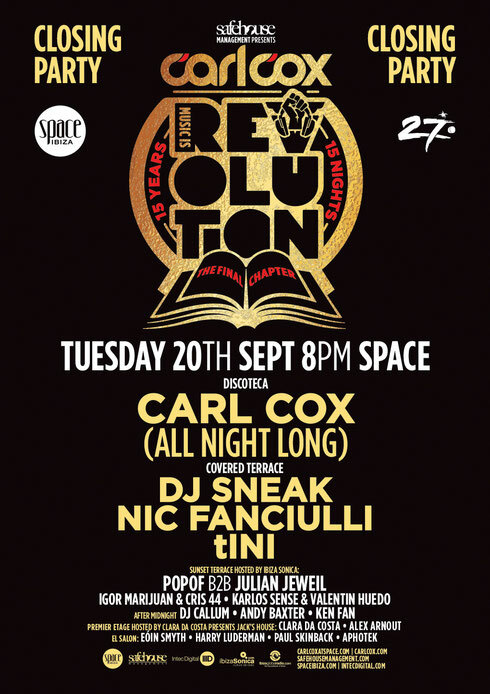 Next Tuesday, 20 September Carl Cox plays Space Ibiza for the final ever time, bringing an end to a record 15-year residency at the Ibiza club. Carl had already confirmed he’ll be playing a mammoth 10-hour set to close his residency, and also confirmed the set will be played using both vinyl and digital – the old with the new. Carl’s final season has proved to be his most popular yet, with every single night apparently selling out – a record attendance, which continues with the closing party, which is already sold out. It’s going to be a big night, with clubbers witnessing a bit of Ibiza history as Carl says goodbye to 15 years at Space. Carl Cox: “At the start of my residency, of course I only played vinyl but now everything is digital and has been for some years. I wanted to take things back and pay homage to all those years at Space spinning records. I want to show respect to those older tunes, dig out some of my old vinyl and play them alongside new tunes. A lot of the crowd probably won’t have even heard them before, so it’s a way of showing the music is still relevant. I thought it was a fitting way to say goodbye. “I also want people to know I can still DJ with vinyl and make the house rock! This music has been my life and I want to share it one last time at Space. For those without a ticket, BE-AT.TV will be there live streaming the whole night.